The D2 Tower redraws the skyline of Paris’ business district and introduces steel into a world of concrete. 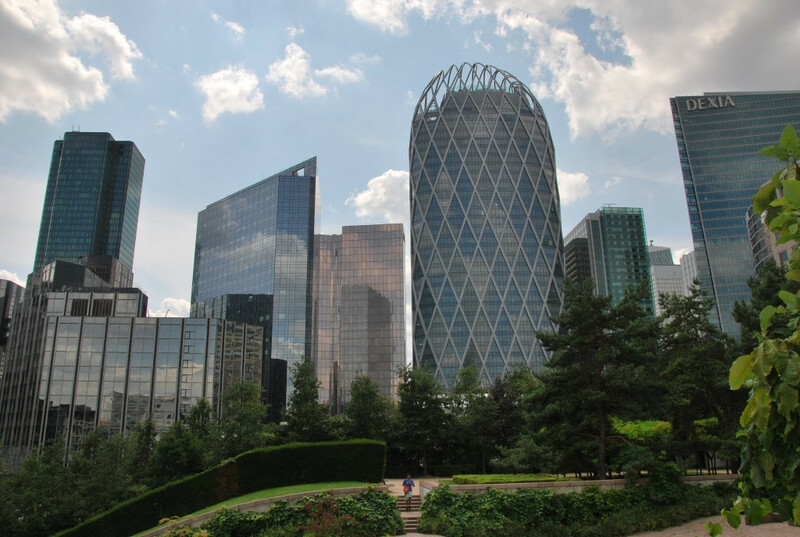 It is the first high rise building in La Defense with an external steel grid structure and stands out with its characteristic shape and diamond façade. ArcelorMittal supplied structural steel and composite flooring deck for this elegant and efficient new tower. With 171m height and 37 floors, the Tour D2 is Paris’ newest landmark and offers a surface area of more than 54.000 m2 of office spaces. The emblematic office building, created by the French architect Anthony Béchu and his American colleague Tom Sheehan, is part of an extensive urban renewal project and is located on the former site of the Veritas Building which was demolished in 2011. The Tour D2’s characteristic oval shape and unique façade design defined by the external diagrid structure is reminiscent of a diamond that sparkles in the sunlight. 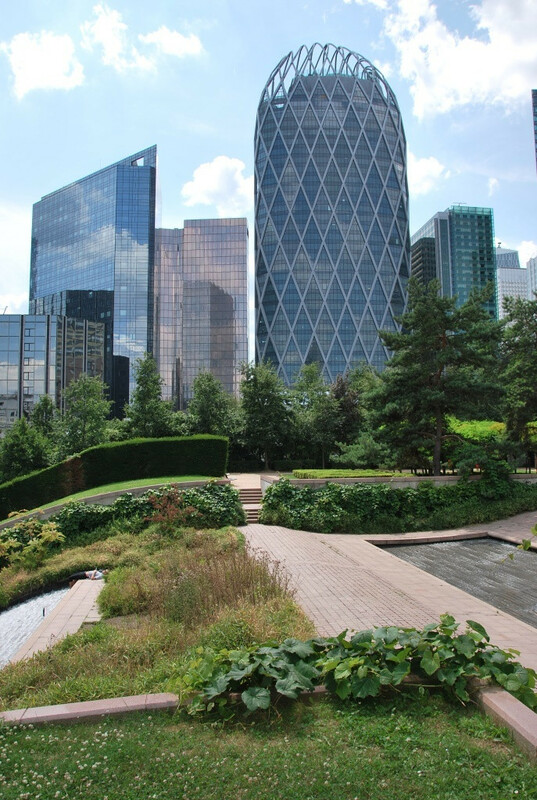 On its top floor, an open roof garden offers a 500 m2 green oasis in the heart of the business centre. Protected from the winds with 2 m high glass windows, the so called “cloud garden” also comprises a small golf course. The external diagrid continues around the garden and an impressive, open steel dome structure crowns the tower’s top. were created. All these aspects contribute positively to the building’s environmental footprint. The façade diagrid consists of large, hot rolled steel sections, mainly HD 400, in high yield steel grade Histar® 460 MPa. These sections of 12m length were assembled on site in shape of a V, each weighing around 14 tonnes. Due to the tower’s oval shape, the radius of the curvature varies and the inclination angles measure between 3º and 15º. Each V, protected with intumescent coating and enveloped in aluminium casing, covers the height of 3 floors and is integrated into the curtain wall of different sized and shaped glazed elements. ArcelorMittal Commercial Sections supplied a total of 4.000 tn of structural steel, 3.000tn of Histar® 460 sections for the external diagrid and 1.200 tn of ACB® beams. With their favourable strength-weight ratio, these cellular floor beams based on IPE 450 and HEA 450 sections allow longer spans at a lighter weight than conventional steel beams and guarantee open, column free spaces. Additionally, the ACB® beams’ circular openings allow the passage of technical installations, gaining thus usable floor height. The ACB® floor beams connect the external structure to the concrete core and support the Cofraplus 60 flooring deck. Supplied by ArcelorMittal Construction France, Cofraplus 60 is composite flooring system that was chosen as well for its light weight and high strength. The solution combines the performance of a galvanized steel profile with that of reinforced concrete. Furthermore, Cofraplus 60 is easy to install which presented a significant advantage on the construction site in La Defense’s tightly knit urban environment. In total, 50.000 m2 Cofraplus 60 were used for the flooring of the Tour D2. The entire flooring structure was protected against fire with fireproofing plaster. Construction could be carried out at a steady rate of 3 floors in 3 weeks, according to time schedule and budget. The reduction of weight and material of 30% was achieved thanks to the massive use of steel in general and high yield steel in particular. Sustainability also plays a crucial role in the tower’s operational phase. All technical installations comply with the highest criteria of energy efficiency and the TOUR D2 strives for the French certification Haute Qualité Environnementale (HQE®). Apart from office spaces, the Tour D2 offers a fitness centre, a panorama restaurant, a cafeteria and meeting rooms with the aim of creating a comfortable, high quality working environment.